The Congressional Budget Office, as part of The Budget and Economic Outlook: 2017 to 2027, has just released fiscal projections for the next 10 years. This happens twice every year. As part of this biannual exercise, I regularly (most recently here and here) dig through the data and highlight the most relevant numbers. Let’s repeat that process. Here’s what you need to know from CBO’s new report. But what happens if there is a modest bit of spending restraint? What if politicians decide to comply with my Golden Rule and limit how fast the budget grows every year? This shouldn’t be too difficult. 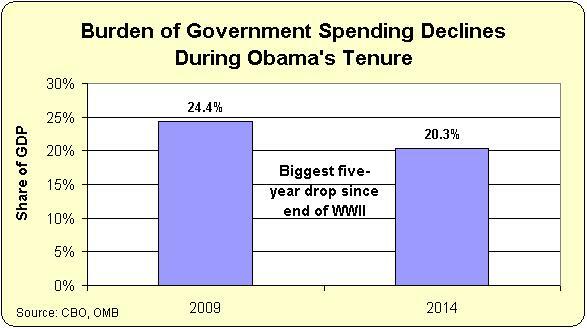 After all, even with Obama in the White House, there was a de facto spending freeze between 2009-2014. In other words, all the fights over debt limits, sequesters, and shutdowns actually yielded good results. So if the Republicans who now control Washington are serious about protecting the interests of taxpayers, it should be relatively simple for them to adopt good fiscal policy. And if GOPers actually decide to do the right thing, the grim numbers in the CBO’s new report quickly turn positive. To put all these numbers in context, inflation is supposed to average about 2 percent annually over the next decade. 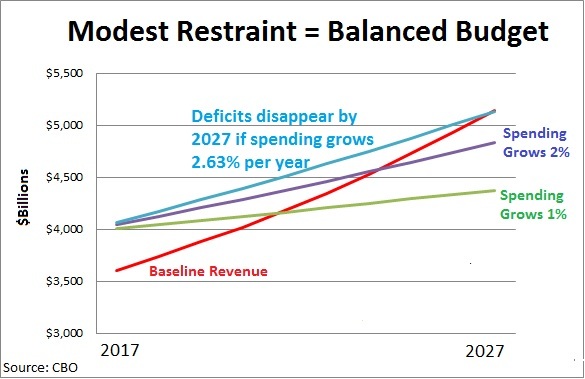 Here’s a chart showing the overall fiscal impact of modest spending restraint. By the way, it’s worth pointing out that the primary objective of good fiscal policy should be reducing the burden of government spending, not balancing the budget. However, if you address the disease of excessive spending, you automatically eliminate the symptom of red ink. For more background information, here’s a video I narrated on this topic. It was released in 2010, so the numbers have changed, but the analysis is still spot on. P.S. Achieving good fiscal policy obviously becomes much more difficult if Republicans in Washington decide to embark on a foolish crusade to expand the federal government’s role in infrastructure. P.P.S. Achieving good fiscal policy obviously becomes much more difficult if Republicans in Washington decide to leave entitlement programs on autopilot. Those budget deficit numbers projected to be 1.4Trillion in 2027. Are those phony numbers like the reported 587Billion defecit for 2016. Or real numbers like the actual budget deficit of 1.4Trillion in 2016 as measured by the increase in the national debt as reported by the treasury at their website National Debt to the Penny!!!!! Two per cent. inflation is high for this country, and should not be accepted as normal. Hope you don’t mind that I linked this to a comment on Instapundit. “Living Within the Squeeze” – Unless current budget trends are arrested and/or we throw deficit and debt caution to the wind, DOD will experience a 5 to 10% reduction in real resources in ten years. Do you agree I can sent you the basis for these projections. We hope to get the best minds together to discuss the ramifications of this for our strategy and planning. Our team: Dave Walker, Adm Bill Owens, myself, Superintendent of USNA and heads of the Econ., Leadership and maybe Pol Sci Dept. Others.